The thin autumnal light weakly illuminates our sandstone, as if its power has been usurped, its strength stolen. 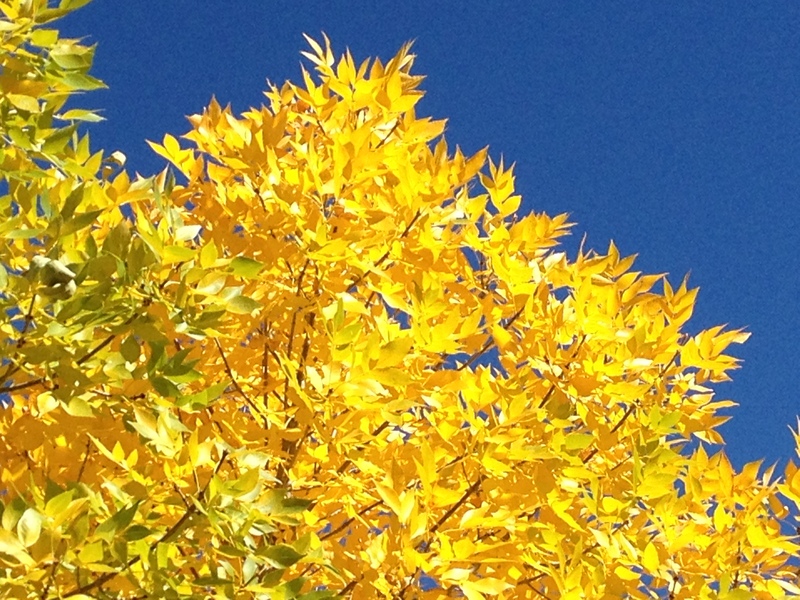 Leaves relinquish their chlorophyll, glittering bright yellow in the sun, contrasting with bluest blue skies. Temperature extremes are behind us. Snowdust caresses the heights of the La Sal Mountains. October is the month that all the locals wait for, long for, yearn for — best month in the calendar. What a gift. And, once more, it is the month in which I find myself homeward bound. House is cleaned, recycling sorted, canned goods given away, borrowed items returned, laundry done, suitcases packed, boxes filled, thrift store donations accomplished. The annual ritual of seasonal park rangers replays itself with little variation. Chris’s last day of work. Photo credit: Yoko. I use superlatives sparingly, but hear this: it’s been the best twelve months of my life. In all my decades, no interval has been as consistently fulfilling and satisfying as this one. 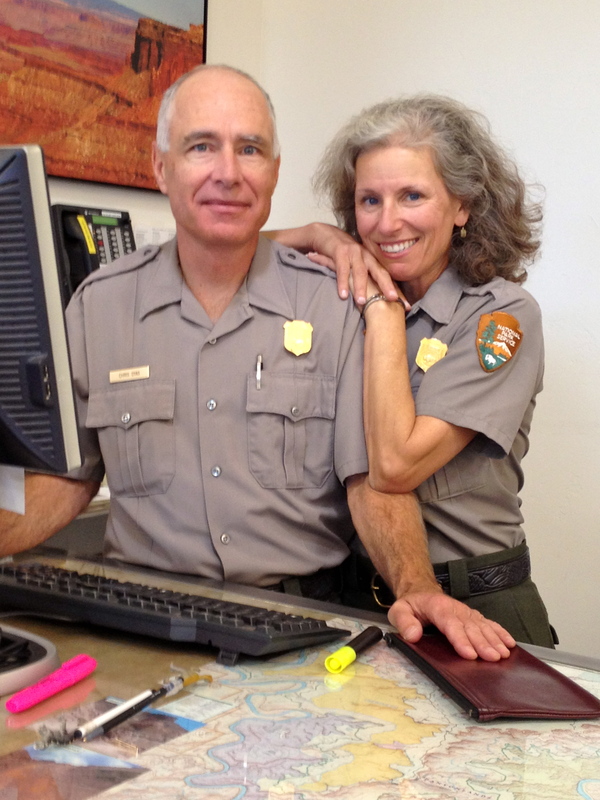 I woke up every day in one of the most beautiful national parks in the country, put on a uniform I love, gave interpretive talks I’m passionate about, shared with visitors my joy. Watched breathtaking sunsets nightly, slept under a Milky Way blanket, listened often to the silence, hiked hundreds of miles, climbed my first desert tower, explored remotest ruins, and fell in love with an extraordinary man. (I tell you, it would still have been the best even without that last bit.) I’m blessed beyond measure. Beautifully, beautifully, this has been a year with many answers. * Opening line of Chapter 3 of Zora Neale Hurston’s novel, Their Eyes Were Watching God. 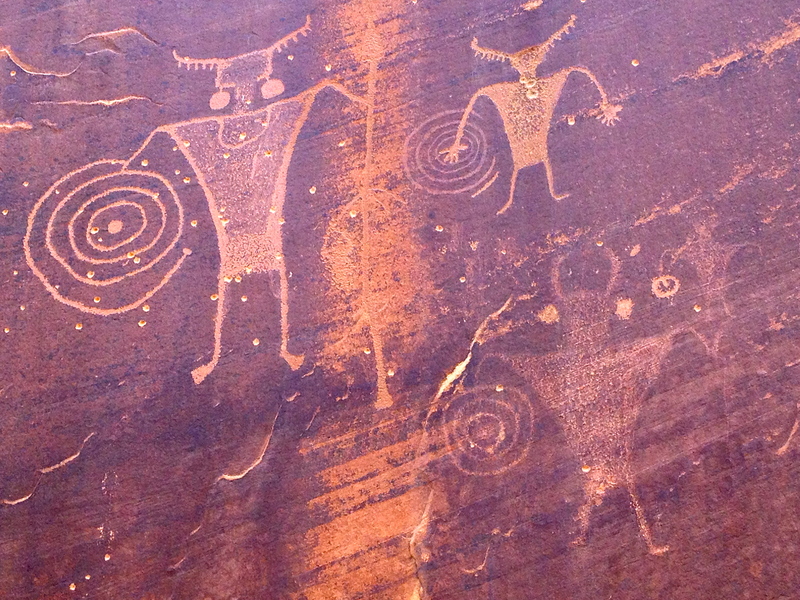 Classic Fremont petroglyphs: trapezoidal figures with necklaces, ear bobs and headdresses. These also have shields and a spear. From our vantage point in a high alcove across the canyon, the large trapezoidal figure seemed to watch us. We watched back — first through binoculars, and then a scramble down and up to approach it. Only then were his three companions discovered, all appearing to hold shields. This is the absolute beauty of rock art: the continual unfolding of images. Meanings, though, usually lay hidden across centuries. Staring at petroglyphs is warmly satisfying. As one’s eyes adjust and scan toward the periphery, more bits come into view. Questions arise like bubbling springs: Was that large spear for hunting, or for defense? Hmm: you don’t carry shields for hunting. Who was threatening them? Why did some artist add ear-bobs to the lowest guy, much later? Is the little man in the right center holding a sparkling timer? What were their necklaces made of? What about those headdresses? Why is only one weapon on display? Current-century questions also arise. What kind of person would use priceless rock art for target practice? As much as the bullet holes detract from the aesthetic, they can’t mar the inherent beauty of these powerful figures. Conjoined twins pecked into rock? Meanwhile, in another part of the county, girlfriend Tara found this petroglyph that looks for all the world like men who are Siamese twins. Never in all my thousands of glyphs have I seen anything like this one, and it piques my curiosity. Many cultures would put the babies out to die if they were born connected, or in some way different from normal. My midwife mind wonders whether a woman eight centuries ago could even successfully birth conjoined twins, when they are always born by Cesarean nowadays. Perhaps this image was something a shaman ‘saw’ in a trance, instead. If one spends enough time in nature, interesting photo opportunities are bound to present themselves. I’ve got a couple of nice sightings, graciously shared by readers, to share with you today. 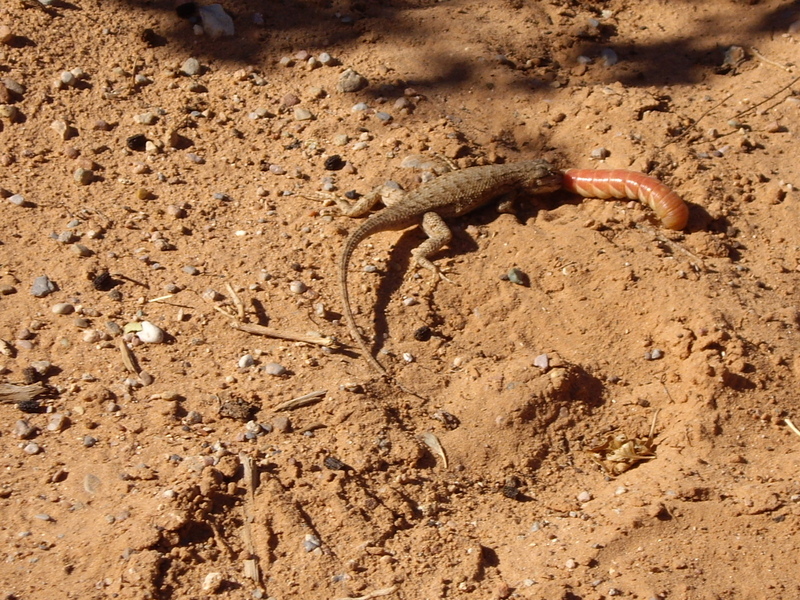 Alice Kao was hiking to Double Arch (Arches NP) recently when she spotted this lizard attempting to swallow a grub. Due to the relative sizes of the two creatures, the lizard gagged on the grub and spit it back out once; finally it managed to swallow it. I honestly don’t know how the grub fit into the lizard’s digestive tract, or how soon it will be hungry again. I get really full just eating three sushi rolls. 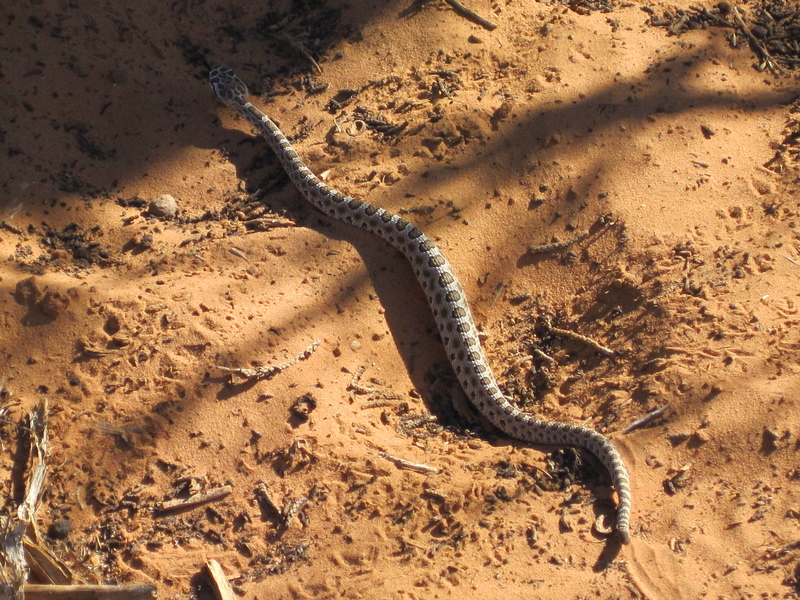 Diane Hagberg, of Minneapolis, was hiking the Primitive Loop in Arches and was rattled at by our Midget Faded Rattlesnake. Giving the 18-inch-long snake a wide berth on the trail, she shot this photo with some trepidation. The Midget Faded, true to its character, shyly slipped away to hide under some rocks, but Diane has bragging rights and some vivid memories. I’ve seen only four rattlers in four seasons here; it’s typically nocturnal. Visitors are fortunate indeed when they glimpse this elusive reptile. Click on images to enlarge for more detail. Thanks for sending the photos my way, Alice and Di! “Come and see what we walked right by.” Chris, eagle-eyed co-explorer, beckoned me to the edge of the high alcove. I had just lain down on a flat boulder to gaze at the sandstone ceiling and the rock art, but it was clear that his discovery was worth interrupting my reverie. In a canyon near Moab. 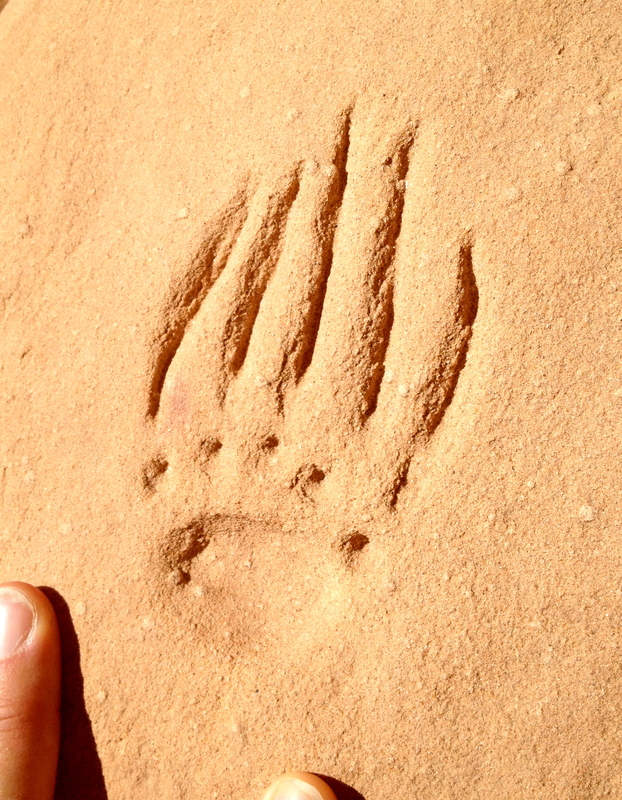 There, right on the approach, was a deeply incised petroglyph. A single claw stood alone, stark in its simplicity, its beauty evincing an ancient artist’s skill. 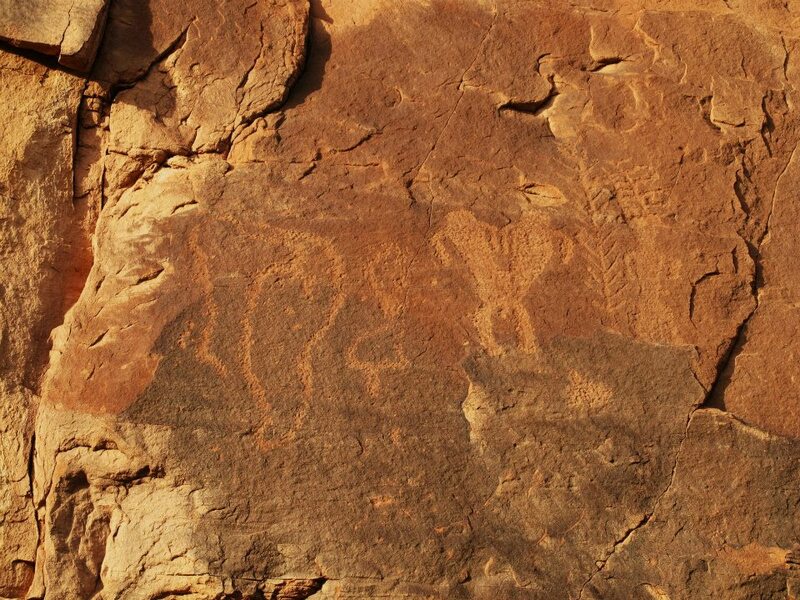 We had been too distracted by the more obvious — the massive recess in the Navajo sandstone, the multi-colored artwork spanning several millennia, the grinding grooves in the boulders, curious carved holes, a water seep. Occasional flakes of chert sparkled in the sunlight, remnants of the tool-making process. The site was clearly occupied for a long, long time, by more than a few people. I could almost hear children’s laughter, women grinding seeds or corn, men sharpening their axes. And then… the claw. Some man long ago selected that boulder and sat down with his tools, abrading the pad to a good quarter-inch depth, adding the toes, finishing with those imposing super-claws. Was he saying that he was part of a clan associated with this animal? Was it evidence of a hunt that fed his people well? Was it a No Trespassing sign? I’ll never know. The lesson at hand: don’t be so distracted by the flashy that you miss the subtle. 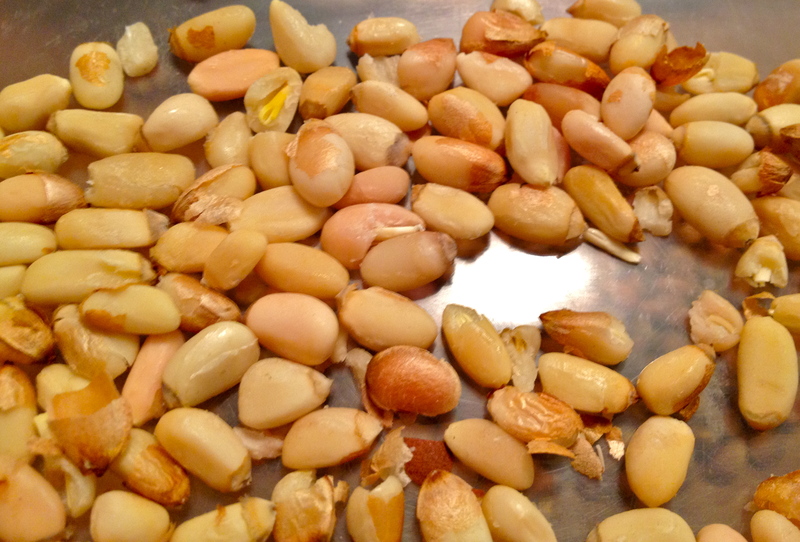 Pine nut shells, whole seeds, and the end result. A labor of love. My desire to eat locally-grown foods and to support family enterprises led me to pull over at the roadside card table selling pine nuts. A young girl stood guard over her supply of pre-measured zip-loks: “Eight dollars, or three for twenty,” she intoned hopefully. The bags looked pitifully small. I said I wanted to know everything about how they collected them. Her mother explained the process of gathering the green cones (in all their sticky sappy splendor) off the pinyon trees in early August, drying them, and whacking the nuts out. Instantly I recalled that early August was when I began seeing rodent-chewed green pine cones on the ground, far before I expected the seeds to be edible. Chipmunks know these things. I promptly bought a bag for the sheer joy of it all. At home, spreading the treasure on the kitchen table, we strategized. Cracking the shells without damaging the seed inside was our goal; I resorted to a garlic press and a one-at-a-time approach while Chris tried a rolling pin over the whole lot. One small nut at a time, fingernails pressed into cracks and gingerly separated the shells. Conversation flowed quietly, gently, with frequent pauses to assess our progress. It was slow, slow, slow. Our fingertips were awfully tender after an hour of prying, with not even a half cup of product. The ancestral people, whose diet included this 3000-calorie-per-pound staple, must have had a whole lot of time on their hands and few distractions. We elected to move on to the final step of roasting in a skillet on the stove until they released their nutty aroma. A sprinkle of water and salt in the pan finished the evening’s work. The result: tasty, simple, healthful, and deeply satisfying. Taking the time to prepare slow foods causes me to savor the result so much more, knowing how labor-intensive the process is. Whether it’s a multi-step lasagna, a long-simmering soup, or doing something yummy with the insides of your Halloween jack-o-lantern, I encourage you to try slowing down your food preparation — just for the heck of it. The mindful process is a joy in itself. Leave a comment: What story do you have about trying to prepare a new, complicated, or unusual menu item?